In its edition of August 8th, 1949, Life magazine ran a feature article about Jackson Pollock that bore this question in the headline: "Is he the greatest living painter in the United States?" Could a painter who flung paint at canvases with a stick, who poured and hurled it to create roiling vortexes of color and line, possibly be considered "great"? 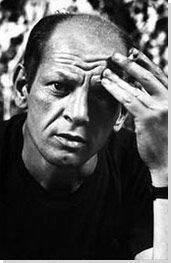 New York's critics certainly thought so, and Pollock's pre-eminence among the Abstract Expressionists has endured, cemented by the legend of his alcoholism and his early death. The famous 'drip paintings' that he began to produce in the late 1940s represent one of the most original bodies of work of the century. At times they could suggest the life-force in nature itself, at others they could evoke man's entrapment - in the body, in the anxious mind, and in the newly frightening modern world. Pollock's tough and unsettled early life growing up in the American West shaped him into the bullish character he would become. Later, a series of influences came together to guide Pollock to his mature style: years spent painting realist murals in the 1930s showed him the power of painting on a large scale; Surrealism suggested ways to describe the unconscious; and Cubism guided his understanding of picture space. In 1939, Pollock began visiting a Jungian analyst to treat his alcoholism, and his analyst encouraged him to create drawings. These would later feed his paintings, and they shaped Pollock's understanding of his pictures not only as outpourings of his own mind, but expressions that might stand for the terror of all modern humanity living in the shadow of nuclear war. Pollock's greatness lies in developing one of the most radical abstract styles in the history of modern art, detaching line from color, redefining the categories of drawing and painting, and finding new means to describe pictorial space. Pollock lived the reclusive and heroic life that ended in tragedy, in line with the commanding impulse he described thus: "Today painters do not have to go to a subject matter outside of themselves. Most modern painters work from a different source. They work from within." Going West exemplifies many aspects of Pollock's early interests. During the 1930s, he was strongly influenced by the American Regionalism of his mentor Thomas Hart Benton, yet Going West is characterized by a dark, almost mystical quality similar to another American visionary painter Pollock admired, Albert Pinkham Ryder. The swirling forms which structure the image evoke the emotional intensity of El Greco and Van Gogh. This image of a pioneer journeying West connects Pollock's emerging style to his own origins. While the scene evokes a sort of gothic mystery, it has been suggested that it comes from a family photo of a bridge in Cody, Wyoming, where Pollock was born. Guardians of the Secret, often interpreted as a metaphor for the emergence of unconscious impulses into conscious thought, represents a synthesis of Pollock's sources. The imagery draws on African, Native American, as well as prehistoric art, yet there are also touches of Miró and Picasso. The abstract male and female 'guardians' have been interpreted in myriad ways: as Northwest Indian totems; Egyptian gods; even as conflations of playing cards and chess pieces wearing African masks. They flank the sides, while along the bottom is a dog reminiscent of Anubis, the jackal-god of the ancient Egyptian underworld. An African mask, a scarab-like embryo, and a rooster, all line up like relics across the top. The rooster is a symbol of fertility, but it may also recall the time Pollock lost the tip of his finger as a child when he put his hand in the way of an axe meant to kill a chicken. In the center of the composition is a tablet, covered in an hieroglyphic inscription reminiscent of ancient tombs. When the canvas is turned upside down, stick figures in various poses emerge. Mural is an early tour de force in Pollock's career, a transition between his easel paintings and his signature drip canvases. This 'all over' painting technique was assimilated from a variety of sources: Picasso, Benton and Siqueiros, as well as Native American sand painting. Measuring nearly 8 x 20 ft, this was Pollock's first large-scale work, and was commissioned for Peggy Guggenheim's apartment. Although influenced by his earlier work in this format, Pollock struggled to control the composition. He incorporated decorative patterns in thinly brushed paint to achieve an intimate pattern within the grand scale. An apocryphal story exists that it was painted in one day and one night, though this is impossible given the quantity of layers in the picture. Full Fathom Five was among the first drip paintings Pollock completed. Its surface is clotted with an assortment of detritus, from cigarette butts to coins and a key. While the top-most layers were created by pouring lines of black and shiny silver house paint, a large part of the paint's crust was applied by brush and palette knife, creating an angular counterpoint to the weaving lines. "Like a seismograph," noted writer Werner Haftmann "the painting recorded the energies and states of the man who drew it." Since their first exhibition, critics have come to recognize that drip paintings such as this might also be read as major developments in the history of modern painting. With them, Pollock found a new abstract language for the unconscious, one which moved beyond the Freudian symbolism of the Surrealists. He broke up the rigid, shallow space of Cubist pictures, replacing it instead with a dense web of space, like an unfathomable galaxy of stars. He even updated Impressionism, creating pictures that seem to glitter with the effects of light, and yet which also suggest the pitch dark and anxious interior of the human mind. While only one painting from Pollock's 1950 solo exhibition was actually sold, the show gained much attention. It was described by Art News as one of the three best exhibitions of the year, and Cecil Beaton staged a famous fashion shoot in the exhibition space, which subsequently appeared in Vogue. Autumn Rhythm was one of the major works which appeared in that show. As with many of Pollock's paintings, he began it with a linear framework of diluted black paint which in many areas soaked through the unprimed canvas. Over this he applied more skeins of paint in various colors - lines thick and thin, light and dark, straight and curved, horizontal and vertical. As the title suggests, the coloring, horizontal orientation, and sense of ground and space in Autumn Rhythm are strongly evocative of nature. The balance between control and chance that Pollock maintained throughout his working process produced compositions that can have as much calm tranquillity as some works by Rothko. Blue Poles, or Number 11, 1952, contains shoe and footprints and even shards of glass embedded in canvas - telling traces of Pollock's vigorous working methods and turbulent life. During the period he painted Blue Poles he was drinking in binges, though Krasner has stated that the painting took a great deal of time and was not the spontaneous result of a drunken fury. It is possible that he employed the blue lines to unite disparate parts of the large picture. Frank O'Hara commented, "The poles are an unusually definite form in the 'all-over' configuration of Pollock's poured paintings and various figurative connotations have been attributed to them - from totems to the swaying masts of tall ships." Yellow Islands was produced in one of Pollock's last productive years of painting. Made during a period when he was concentrating on black and white pictures, Yellow Islands likely began as a purely black canvas. Swift and aggressive gestures are interspersed with a large amount of black paint that was clearly poured onto the canvas while it was in a vertical position. After allowing a certain amount of stain, Pollock added areas of yellow and crimson with a brush on top of the black. He then lifted the canvas upright while the paint was still wet, allowing it to run. 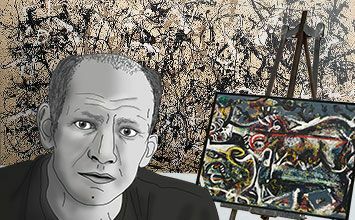 The 1950s saw considerable changes in both Pollock's work and personal life. He began avoiding color in 1951, and started painting exclusively in black, though with alcoholism taking over his life, his productivity steadily declined. The Deep evokes a chasm - an abyss either to be avoided or to get lost inside. White paint was built up with layered brush strokes, showing a return of Pollock's direct involvement with the canvas. Drips are still evident, now creating a web that floats above the chasm. Pollock was clearly looking for a new approach, an image to create, desperate to break away from his signature style, yet his last paintings represent neither a new beginning nor a conclusion.